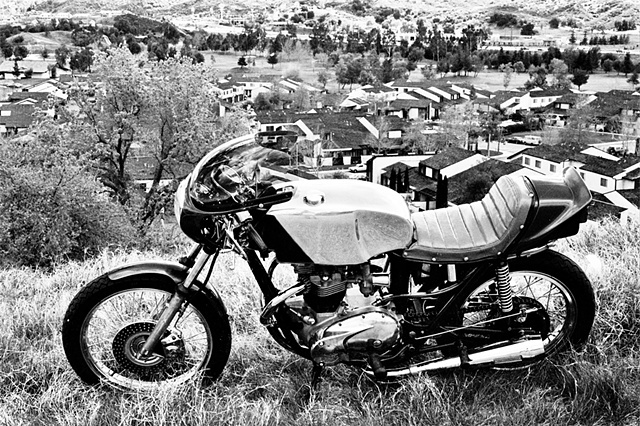 My 1973 Triumph Bonneville became an academic controversy of whether or not I had fulfilled my graduating requirements. I might not have been be able to graduate from Art school due to my ulterior motives. I built this cafe racer the last semester before my graduation from CalArts. The faculty would not consider it or the act of creating it as an artwork, even though I did. I documented its evolution from a basket case to a quintessential elegance of mobility. After the initial rejection, recording and developing an adequate portfolio came abruptly afterwards and was passed off successfully as a result of the attempting to recreating a "failure into a triumph!" The images from that portfolio are seen here at: rvmann.com/artwork/2557992_Matrimonial_? or click next below that page or here at: rvmann.com/artwork/2558443_Matrimonial_? "Triumphs motorcycles were born into a unique breed of the iron horse society"